When Lauren fell pregnant with her second son, she couldn’t wait for the two brothers to meet and become the very best of friends. Things started well: “My older son, Max, cried when I had to take his brother, Ollie, back after their first cuddle,” Lauren said. Unfortunately, things took a bit of a downhill turn after that. Kids at their siblings birth: Crazy or wonderful? 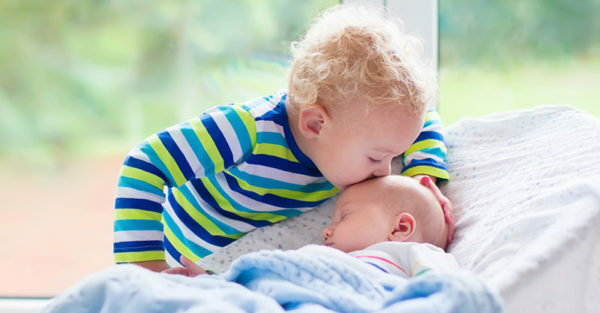 Baby Ollie is now 18 months old, but the brotherly love Lauren dreamed of isn’t there. She says she’s tried everything to help older son, who is three, connect with his little brother. Lauren says three-year-old Max is usually a delightful little kid who is kind, social and goes to daycare happily. According to mothercraft nurse Chris Minogue, this is all normal behaviour. “You are doing everything right and have tried everything you possibly can try,” says Chris to Lauren. Chris recommends focussing on developing strong boundaries as well as empathy and sympathy as they are the foundations of friendships that will happen later in life. The other important piece in this puzzle is making sure you parent each sibling mindfully. Make sure you spend individual time with both boys and discipline each child according to their age. “Give them the basics, and they will work it out,” says Chris.